James Kwambai defended his title and set a new course record, by well over two minutes. Over 14,000 runners from 11 countries took part in favourably cool (10°C) conditions. 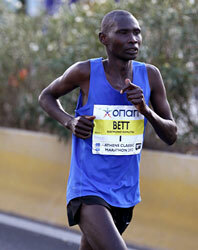 Pacemaker Stephen Kibet passed through 10km in 29:56, 20km in 59:58 and 30km in 1:30:00. He then dropped out to leave Kwambai with a clear lead. 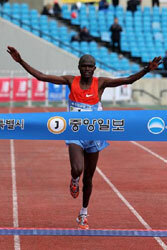 Kwambai sped up through 35km (1:44:33) and 40km in 1:59:15 to coast home to an easy win and an impressive new record. The women's race featured a domestic field in which Kyung-Hee Choi went clear after 35km to win by a margin of two minutes. Raymond Bett shaved a few seconds from the event record in this 30th edition of the race over the original marathon course used in the inaugural 1896 Olympics. Bett, who won the race two years ago, ran conservatively with a lead group of about a dozen until the first flat 11km had been run and the 20km-long rolling ascent into the hills had begun. By the end of it, with 11 gently downhill kilometres to run, he had only three others for company and they gradually peeled away so that after he dropped Alex Kirui with about 4km to go he was left with a clear run to the finish line in the Panathenaiko stadium. Paul Kosgei passed Kirui inside the stadium to take second place. Bett said, "I used the experience of winning here two years ago to come through at the end. The conditions today were good, but if I come back again, I think I could break the course record". The course record, set during the 2004 Olympics winner, is Stefano Baldini's 2:10:55. In her marathon debut Consolater Chemtai Yadaa won the women's race in exactly 2:40:00, only 30m ahead of Svitlana Stanko. Prizes were presented by World record holder Patrick Makau and 1988 Olympic Champion Rosa Mota, who had themselves collected awards on the Friday night at the AIMS-Athens Classic Marathon 30th Anniversary Gala. The race has expanded considerably since the 2500th anniversary two years ago, of the Battle of Marathon, the event which ultimately gave rise to the creation of the event for the inaugural modern Olympic Games. There were just under 10,000 runners in the Marathon and 20,000 in the 5km and 10km races in Athens city centre. Under difficult weather conditions, Ethiopians Kedir Fekadu and Saeda Kedir were victorious at the 10th edition. The rain and wind did not stop more than 33,000 participants from 96 countries filling the streets of the city. Apart from the Marathon, there was a 42.195 km relay race, a 10km fun run, a 5km youth run, and a 1km run with mom and celebrity run. The 1km celebrity race was added this year in order to get the general public interested in running and in order to create an atmosphere of positive sports values in the country in the face of the unrest in the region, and especially after the unfortunate explosion that rocked Beirut a few weeks back. The running community rallied to help the victims and seven Lebanese Marathon runners dedicated their race to raising funds for this cause, in coordination with local television station LBC, who ran a telethon for this purpose during its live broadcast of the race. Lebanese winners were Houssein Awada (2:28:29) and Maria Pia Nehme (3:16:38). Stephen Chebogut held back until late in the race as Kiprotich Yegon paced the field through halfway in 1:02:47. After 35km Chebogut led as others quickly fell back, giving him a winning margin of over four minutes. The women's race was more tactical, although Jelela, the fastest in the field, led from the start. At halfway (1:12:30) she led by 20m from compatriots Amane Gobena and Alemitu Abera, with Ethiopian-born Sultan Haydar, running for Turkey, a similar distance further in arrears. Jelela and Gobena went clear in the final stages, and Jelela eventually proved the stronger of the two. Runners started the three-day Challenge on Friday afternoon in bright sunshine and good weather continued right through the weekend. The first 11.195km stage is a lap run from the old capital of Mdina in the centre of the island. Many previous winners started, along with two runners invited by the Malta Tourism Authority, Bartsz Mazerski from Poland and Vladimir Sementsov from Russia. Mazersky quickly established himself in the men's race with five-time series winner Carmen Hili heading the women. By the end Mazersky led Sementsov by 53 seconds, and Hili had a lead of over four minutes. Stage 2 the next day was a 6km lap around the pretty seaside resort of Birzebbuga. The course record for this stage has stood since 1992 but Mazerski ducked under it by three seconds — yet Sementsov was a further two seconds ahead with 18:26. Hili, now 41, stretched out her overall lead by almost another two minutes over the Dutch runner Suzanne Weide. Sunday's 25km final stage started at 7:00 am from St Paul's Bay for an eastbound coastal run-in to the island's capital, Valetta. Vladimir Sementsov's wife had been taken ill and he had spent most of the night in hospital with her, but at 10km was matching Mazersky's torrid pace, and both were on track to break the 20-year old overall course record. Although both runners later slowed they were neck and neck in the final kilometre, with Mazersky eventually prevailing by a single second. His overall time was the fastest for 15 years. Hili had the women's race won, and with it the series, but behind her the young Maltese Roberta Schembri ran a strong race to hoist herself above Weide for second in the overall ranking. The 32nd Beijing Marathon, re-scheduled from 14 October, hosted 30,000 runners in feezing conditions writes Mirko Javala. Eliud Kiptanui took the lead from a large group around 24km, pulling the Ethiopian pair Tariku Jufar and Solomon Molla along with him. This trio travelled together to 35km, which they passed in 1:52. The 28-year-old Jufa then quickly opened up a big gap. Molla moved into second as Kiptanui slipped back to third, but the Kenyan regained second place soon after 37km. Things stayed this way until the finish line with no real sprint finish. The women's race remained open up to 35km where Sun Lamei and Jia Chaofeng were running side-by-side in the lead with Sun Weiwei following close behind. Jia changed pace quite close to the same place where Jifar took the lead and just like in the men's race, she quickly left Sun behind and was really not threatened in the long final straight. Sun Lamei, 21, took an impressive second in her second career Marathon with a big personal best 13 minutes faster than her debut in 2009 at the age of 18. Third-placed Sun Weiwei, who clocked her personal best 2:25:15 for fifth place in Beijing 2002 at the age of 17 in her Marathon debut, finished with a season's best and the fourth best clocking of her career. The race brings together Ethiopia's best traditions in long distance running with the country's unique cultural celebrations writes Elshadai Negash. It usually serves as an opportunity for Ethiopia's young and upcoming runners to move on to an international running career. This year's winners, however, were no newcomers. Hagos Gebrhiwet, 19, earlier this year became world junior record holder for 5000m and Aberu Kebede won the Berlin Marathon. Gebrhiwet had to battle long and hard with Berhanu Legesse and Belete Assefa before clinching his first ever victory in this race. Gadisa Berhanu headed a lead pack of 15 through the first half before trying to break at 6.5km. He succeeded in dropping all but five others, leaving six still in the hunt at 7km. Gebrhiwet then dropped back slightly, which slowed the field and allowed the six to re-group before the pace began to increase again from 8km. Assefa and Legesse exchanged the lead for the next kilometre but did not get any gap. Gebrhiwet assumed the lead at 9km and surged to victory. "I opted to stay behind because the weather and pace was a bit tough" explained Gebrhiwet. The women's race had a similar sustained finish from Aberu Kebede, overcoming the challenge of up-comer Tsegereda Girma and Olympic 10,000m finalist Belaynesh Oljira for a closely-fought victory. Fifteen women passed halfway in 16:18 with Kebede already leading the way. After 7km (23:06) Kebede made the first of two breakaway attempts, but Girma stormed out of the pack to cover the move. The group then dwindled to six as Girma went ahead, putting most others in trouble. Kebede was the exception, and she opened up a 10m gap. Girma and Oljira got back on terms but Kebede kicked again with 300m to go, and sailed through the finish 15m clear. "I was a bit scared of losing today because for a long time I was training only for the Marathon" said Kebede. The 10th edition of the Hyderabad 10km celebrated a new partnership as the race founders brought on board professional race organisers Procam International who recruited a new title sponsor, Jamba Cloud. The race started at 6:40 in cool conditions, with a group of four leading men holding together for the first half of the race, passed in 13:40. Soon after, the group split, with Nicholas Kipkemboi making the pace and Mosinet Geremew following very closely, while looking ominously relaxed. Defending champion Daniel Yegon tailed off alongside Jackson Kiprop, and for the rest of the race it was a tale of two pairs testing each other. Geremew kicked ahead of Kipkemboi with 200m to go, but it remained a close-fought race to the finish. In the women's race Beatrice Mutai and Yebrgual Melese were a cut above the rest of the field, passing through halfway together in 16:53, already 35 seconds up on the chasing group of three. In the second half Melese upped the pace, and by the finish line had outdistanced Mutai by a margin of 80m. They alone recorded negative splits, and took another minute out of their closest pursuer, India's Sudha Singh. Runners started in almost perfect, cool, running conditions but the wind got up after only a few kilometres through the city centre writes Norrie Williamson. The leading group of six then headed into the north wind in single file. After the turn the pace picked up with Fathi Sliman, Thef Allah Matar and Raafat Alzoboun together in a tight group for the next 7km, after which Sliman and Matar started to test each other. But it was Alzoboun who edged an advantage to take the win on the line. Soujoud Alkhutaba was the only woman to break the 90 minute barrier. It was windier still for the start of the 10km, as a field of 600 took the 'running tour' along the roads of the sponsors' new lifestyle resort. The large early pack was decimated by their headlong effort and by 5km was down to three. Hamzeh Almadahneh had the better of his challengers who were unable to respond to his kick with 800m remaining. Hanaweeha Hasab was unchallenged in the women's race, the only one to beat 40 minutes. It was a day of celebration with Prince Firas Raad, and his wife and family running the 10km distance before attending the medical open day at Aqaba hospital as part of the races charity project. The event is organized under the Neurological Society, and is held to raise funds and awareness. Many top doctors donate one day of their skills, knowledge and time to give free medical attention to the most needy.